The beginning of September marks the month of world awareness for Alzheimer’s Disease around the world. In 2016, it is estimated that around 5.4 million Americans have Alzheimer’s, with the majority being age 65 and older. Alzheimer’s effects not only those diagnosed with the disease but also their families and friends. In honor of raising Alzheimer’s awareness this month, here are some interesting things to know about the disease. What is Alzheimer’s disease? Alzheimer’s disease is the most common form of dementia. Plaque develops in the spaces between nerve cells, limiting the communication between the cells, which results in a decreased cognitive function. Proteins that channel chemical messages inside the nerve cells deform and tangle which leads to the loss of these nerve cells. There are three general stages to Alzheimer’s: mild, moderate, and severe. In the mild stage, people with Alzheimer’s can independently function but may have trouble remembering words, names, places, or objects. In the moderate stage, people with Alzheimer’s may confuse words, become frustrated or angry, act in odd ways, and have difficulty expressing thoughts and performing everyday tasks. In the severe stage, people with Alzheimer’s may have difficulty communicating, have changes in personality, need extensive help and care, and lose the ability to control movements. Within these three stages there are many more symptoms that can occur. For people diagnosed with Alzheimer’s disease, there are free and local support groups that are designed to provide emotional and social support. There are also free and local support groups for caregivers and family members that are educational but also emotionally supportive. Check out our website www.plusonefoundation.org to learn more and see how we’re making a difference. 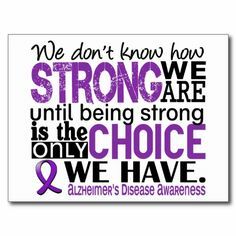 Although Alzheimer’s is a tragic and horrific disease, there are many people out there that are affected by it because it is so common. The most important thing to remember is you are never alone and there is always help available for you.